VIK Arena Blanca Review: VIK Arena Blanca Punta Cana is located on the wondrous Bavaro Beach and the amazing lagoon-style pool will amaze you. This is a resort designed to satisfy your need for excitement, luxury and relaxation. Stroll on the beautiful, white sand beach, while the Caribbean blue water laps up beside you. Set your watch to the tides and get lost in paradise. VIK Arena Blanca offers all of the conveniences and luxury you would expect from a four star resort in the Dominican Republic. Rejuvenate your soul in the warm sun, by the pool or on the beach. Spice up your day with the water sports offered on the beach. Find romance while surrounded by paradise or give your kids the family vacation of a lifetime. Vik hotels has taken over LTI and upgraded the property and put in a five star section and a new restaurant. This amazing hotel just got a whole lot better. Definitely worth a try on your next trip to paradise. VIK Arena Blanca Review Beach and pools: You’ll get lost in the romantic allure of the resort on your first night as you see the exceptional scene of the large pool lit up under the moonlight, surrounded by lush tropical gardens. The soft glow of the paradise blue water will make you surrender your senses to the potential that LTI has to offer. In the day time the pool offers an oasis from the hot sun. A children’s pool is integrated into the larger pool. Palapas and lounge chairs are available beside the pools and along the beach for your ultimate comfort. Soak up the healing powers of the sun, the sand and the sea at VIK Arena Blanca. VIK Arena Blanca Review Restaurants and Bars: Guests can choose from a choice of buffet or a la carte style restaurants. In all restaurants, food is made fresh and delicious. The al la carte menus include Italian, Seafood, a pizzeria and international cuisine. A snack bar located between the restaurant and the beach will satisfy your craving for hot dogs and fries, while keeping you close to the beach. VIK Arena Blanca offers four different bars throughout the resort, including a disco, 24 hour bar and of course a swim up bar in the large lagoon like pool. VIK Arena Blanca Review Activities: Marine divers are drawn to VIK Arena Blanca because of the professional diving club located within the resort. Guests looking for something to do will love the resort’s tennis courts and water sports. Beach Volleyball is always a Dominican favorite. Golf enthusiasts will appreciate the proximity to local golf courses. The resort offers a wellness center and state of the art fitness center. Combined with the spa, these facilities are sure to rejuvenate all weary travelers. Shortly after VIK Arena Blanca took over this hotel that was formerly known as LTI beach resort All Inclusive Resorts reps spent a few days there to check out the facilities. They were pleased to announce that VIK's reputation for attention to detail was immediately apparent. Food: The food at the resort was very good and the buffets served enough of a variety to please even the pickiest of eaters. The a la carte restaurants were far above what you'd usually find at a four star resort as well. Rooms: The rooms were very well appointed, clean and the air conditioning worked well in all of the rooms that were visited. The fact that this resort has a considerable number of family rooms shows that they are paying attention to what their clientele is looking for. The family rooms have the beds in a separate room providing privacy for people wanting to stay up a little later. Size of VIK Arena Blanca: This is a small resort by Punta Cana standards which means less crowds, lines and that the staff tend to get to know you during your stay. It's always a pleasant surprise to walk up to the bar after you've been at the resort for a couple days to have your "usual" waiting for you. VIK Cayena Beach: When VIK took over the property they built a new 5 star boutique hotel directly on the beach. The Cayena Beach section is a beautifully romantic 5 star hotel where almost every room is oceanview. Not very often do you find an "oceanview" room where you can actually walk right out of your room onto the beach. This section also boasts its own private pool and quite a few other perks that make for a true escape. Beach: VIK Arena Blanca is located on a beautiful strip of Bavaro Beach, white sand as far as the eye can see and without the thousands of bodies that you'll find at other resorts. In terms of 4 star Punta Cana resorts VIk is definitely our staff favorite - it's quaint, clean and beautiful. Definitely worth a visit on your next Punta Cana Vacation. 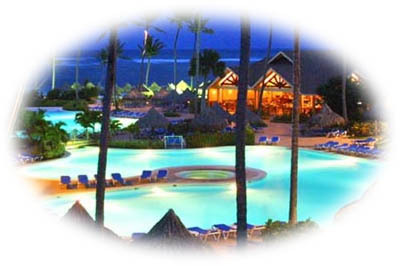 Anxious for your trip to VIK Arena Blanca Punta Cana? Hit any of the "Get Quote" buttons on the page and we'll send you a booking confirmation form or give us a call toll-free and we'll answer any questions you may have. Let's make that dream vacation a reality - join the All Inclusive Resorts Family. Do your own VIK Arena Blanca review this season!